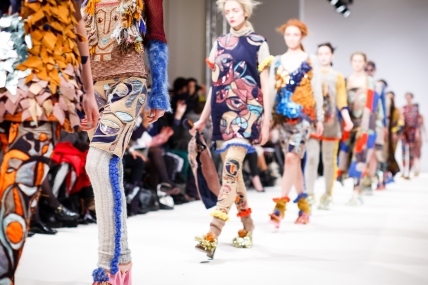 It’s been a turbulent time for the fashion industry of late, with changes affecting the market from every angle. Global shifts in commerce and changes in consumer behaviour have contributed to market decline, presenting a huge challenge to brands in terms of how to reflect this stark reality in their autumn/winter 2017 shows. What we did see was the traditional flamboyance and inaccessibility of past fashion weeks put to one side. With the market in decline, brands were taking fewer chances, it appears. And as the turnaround time from the runway to consumers’ wardrobes shrinks, the pressure for collections to be commercially successful is clearly more keenly felt now than ever. The overwhelming theme of Fashion Week 2017 was therefore a return to function, with a subdued, accessible aesthetic dominant. The 90s influence was evident in many of the runway shows, with Versus Versace utilising Bruce Weber photography from the decade and Topman producing tracksuits and hoodies with a 90’s rave aesthetic. With iconic brands of the period such as Adidas and Sketchers in growth this year, the trend seems to be becoming a staple amongst the public. With the introduction of “international urban luxury brand” at the fashion awards last year, Athleisurewear looks set to be prominent again throughout 2017. We saw a grittier interpretation this year with generously oversized outerwear and loose cuts. With women’s sportswear still in growth 4% year on year and women’s tracksuits in particular also growing within the market, there’s clearly more life in the trend in the short term, but less clear is whether this is sustainable. Men’s sportswear is already seeing a drop, which could indicate we have seen the peak of this trend. But it’s going to be an influential backdrop as we continue to move towards a more laid back look. Menswear casual was weaved through many of the men’s fashions shows, conveying a more down to earth and relaxed approach to dressing. Grace Wales Bonner, Craig Green and Christopher Shannon brought collections to the runway which had a more tangible connection to the everyday looks we see out on the streets. Our data supports this story of a rise in a softer look; while men’s wear is still in growth by +1.7%, men’s casual jackets were up at Christmas +7.6% YOY and men’s smart shoes down -7% YOY. Overall there was a common thread throughout the shows, reflecting a clean and simple aesthetic – a far cry from last year’s outlandish silhouettes. This year London Fashion Week reflected on the challenging year ahead with a strong yet comfortable aesthetic. Pared back, accessible looks dominated shows reflecting the changes happening in wider business and society. A clear take away is that the uncertainty of the coming year means both consumers and designers need to be flexible in their approach to fashion. With more and more external factors influencing design, a lean and agile approach is the best strategy for the coming seasons.